This obviously holds big implications for the rankings, which are based on the generic win probability (GWP) of a particular team against an average team. But more importantly, both are predictive models which emphasize factors that best suggest how likely a team is to fare in the future. When one improves, the other should theoretically improve alongside it. We'll keep an eye on that hypothesis as the season moves along. Perhaps I'll write something at the end of the season comparing the accuracy of this year's model to 2013's. For now, let's take a look at some of the most notable trends from the first rankings of 2014 (click here for a full explanation of the rankings methodology). - The Tennessee Titans are 1-2 and have been outscored by a combined 59-17 margin over their last two contests. Nevertheless, they rank fifth overall after Week 3, highlighted by a sixth-ranked defense in terms of overall efficiency. How do we begin to justify this ranking for a team that has generally appeared incompetent after an impressive Week 1 road victory at Arrowhead? Well, start with the pass defense, which has posted a pass success rate of 52.9 percent, ninth-best in the league. Indeed, the troika of Alex Smith, Tony Romo and Andy Dalton have combined for just 11.5 cumulative Expected Points Added (EPA), a mark that would rank 24th in the league if posted by a single quarterback. It seems fair to assert that pass defense holds a relatively strong correlation with winning. Of the top 10 teams in pass defense efficiency last season, only three (Buffalo, Cleveland, NY Giants) finished with losing records. Conversely, only the Packers and Chargers posted winning records while finishing among the bottom 10 pass defenses, and neither even reached double-digit wins. Nevertheless, the Titans are virtually average in every other category besides defensive interception rate, a notoriously fluky stat that gets discounted in the rankings formula. Brian noted that the Titans unadjusted GWP is actually 0.51, portraying a nearly perfectly league-average team. Indeed, the strength of Tennessee's ranking lies mostly in the fact that they have played the Cincinnati Bengals. It's probably no spoiler alert that the Bengals are by far the top-ranked team at the moment, and that has driven up the Titans' strength of schedule. This caveat applies to all teams; squads like the Patriots and Cowboys have been punished by virtue of playing multiple weaklings so far. Other teams like the Packers and Ravens have received boosts because of the opposite effect. The Titans illustrate how anyone who strays even slightly from 50 percent opponent GWP is going to see their ranking affected drastically. Keep that in mind as you read through these for the first time. - On the opposite end of the spectrum, the New England Patriots currently rank 26th overall despite possessing the top-ranked defense. That mark is anchored by the third-ranked pass defense by EPA/P, seemingly validating everyone's excitement over the offseason Darrelle Revis signing. While they have only played Ryan Tannehill, Matt Cassel and Derek Carr thus far, no one in Foxboro is complaining about the defense (for a change). Instead, an offense that has been the NFL's most prolific over the past seven seasons has cratered to 26th overall, a ranking that fits the eye test. Simply banking on his track record to suggest a rebound is not particularly compelling evidence, either. The Patriots offensive line, traditionally a strong unit, ranks 24th in total pass EPA so far. With offensive line guru Dante Scarnecchia retired and stalwart guard Logan Mankins in Tampa, there is no guarantee that trend changes. More importantly, New England's running game appears lost. After the Patriots finished sixth in run success rate last year, the ground game ranks 17th in that same statistic so far this season. Stevan Ridley and Shane Vereen have combined for a cumulative -6.8 EPA so far, perhaps another unfortunate derivative of that putrid offensive line. New England's defense is for real, so expecting the league's most consistent franchise over the past decade to collapse is likely fallacious. But unlike last season, when injuries could explain away much of the Patriots' early-season offensive struggles, this year appears much more ominous. - The Cincinnati Bengals are the best team in the league by most accounts, so there is little surprise that they sit at the top of these rankings. As the only team in the league with a top five offense and defense, years of draft-and-develop success have yielded a deep roster with no glaring weaknesses. Dalton currently leads the league in both adjusted yards per attempt and adjusted net yards per attempt (among QBs who have started all 3 games so far). 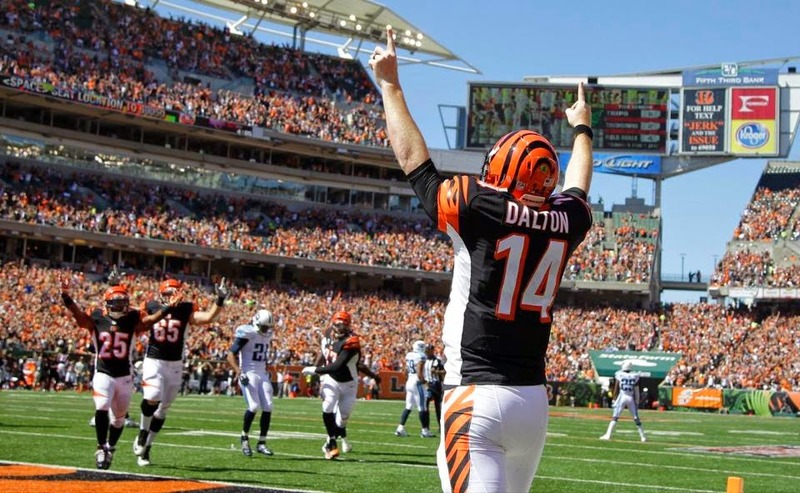 The latter has been shown to correlate most strongly with winning among all passing stats, suggesting that we take Dalton seriously in spite of his physical limitations and tendency for unpredictable rashes of turnovers. Decades of futility and recent playoff failures will cause the Bengals to fly under the radar all season. But ignoring the narratives, the numbers support the claim that Cincy a legitimate Super Bowl contender. - The Arizona Cardinals are almost squarely league-average team, with a GWP of 0.51 that lands them 15th overall. The 10th-ranked defense makes sense, a testament to their otherworldly secondary and a front seven that has somehow overcome the losses of Darnell Dockett, Darryl Washington, Karlos Dansby and John Abraham from last season's core. So turning our attention to the 26th-ranked offense, we can see that Arizona's problems largely stem from their running game. The Cardinals' 30 percent success rate is third-worst in the league and well below the league-average of 41 percent. We might suggest that part of that results from playing the Giants, who have the league's top-ranked run defense by success rate, but that was actually the only game in which Cardinals running backs combined for a positive EPA. It's unclear if we should expect that trend to last. Andre Ellington was spectacular in limited duty last year, finishing eighth in EPA/P among running backs, but he currently ranks 50th with a -0.09 EPA/P in 2014. Ellington has been playing through a foot injury that was supposed to cost him significant time, so if he remains hampered throughout the season, the Arizona run game could suffer as a result. Still, the Cardinals have gotten excellent quarterback play, with both Carson Palmer and Drew Stanton ranking in the top 10 in EPA/P. Arizona won 10 games last year despite possessing the 28th-ranked running game on a per-play basis, so there is little reason to believe they cannot reach double-digit wins again based on their lack of success in that department. - The Philadelphia Eagles check in at 22nd overall, illustrating how their undefeated start has been the byproduct of numerous felicitous factors. Despite playing a relatively soft schedule (0.47 Opp GWP), the Eagles have needed fourth-quarter comebacks in every single game so far. Football Perspective's Chase Stuart conducted some research showing that teams in Philly's circumstances have gone on to win just 53.5 percent of their remaining games over the remainder of the season. Even if the Eagles finish, say, 6-7 the rest of the year, a final 9-7 record might be good enough in the mediocre NFC East. There's also reason to believe the the Eagles are due for some positive regression to the mean—their running game that dominated the league last season ranks just 21st in EPA/P this year. Right tackle Lane Johnson will be back in Week 5 after serving his four-game suspension, while injured starters Evan Mathis and Jason Kelce will return for the second half of the season. Philadelphia is fortunate to be 3-0 rather than 2-1 or 1-2, but this is a generally well-rounded team that should rise up the rankings in due time. - Some of Cincy's excellence has been driven by luck—the Bengals are well above-average in offensive and defensive interception rate as well as offensive fumble percentage, where they are the only team in the league yet to fumble. On the opposite end of the spectrum, the New York Jets and Tampa Bay Buccaneers are the two unluckiest teams in turnover variability, with well-below average marks in all three categories. Both those teams employ turnover-prone young quarterbacks (assuming Tampa turns to Mike Glennon at some point), so those offensive woes might improve too much. Still, though neither squad appears particularly threatening at the moment, a little positive regression to the mean might lead to an extra win or two later on. - Think of the New Orleans Saints as the anti-Eagles. Despite their poor record, the Saints have been victims of some poor late game luck/execution. In reality, it's not hard to imagine New Orleans at 3-0 and Philly at 1-2. Though the reverse is true, these rankings have the Saints at fourth overall despite a below-average strength of schedule (0.48 Opp GWP). Apart from pass defense, New Orleans has been well above-average in every other category, highlighted by the third-ranked run success rate. The Saints are also one of just six teams without an interception so far. With Atlanta's defensive woes and Carolina's house-of-cards offense, the Saints still look like the NFC South favorites. - It's astounding that the St. Louis Rams' opponents GWP sits at 0.40, by far the easiest strength of schedule in the league so far. In playing both the Vikings and Buccaneers, the Rams have faced the other two bottom-three teams in the rankings. That's likely a large factor their 31st overall ranking, and that Opp GWP will shoot up once they get into their NFC West schedule. Still, the Rams also have the lowest GWP themselves at 0.38, illustrating that St. Louis' perpetual rebuilding remains a work in progress. Let me know in the comments what you think of this write-up's format. I'll make no promises about word count due to my tendency to ramble, but what do you want to see from these articles? A deep focus on a couple teams or a more cursory glance over multiple teams? A strict explication of the stats below or analysis that doesn't stick so closely to this site's stats, which you might want to look up on your own? Most likely, you'll want me to shut up so you can finally see these rankings. Wish granted; here are the first team efficiency rankings of 2014. The ranking of the Washington football team at #9 says a lot about a ranking system that doesn't include special teams. Being a fan of this particular team, I think their offense and defense have played pretty well this year and were pretty average last year. Their special teams is abysmal, probably the worst special teams play ever over a two year span. where are the run and pass rankings? Sterling, it's good what you're doing. Picking out a couple teams which are "surprising" in the rankings (likely because they are far from conventional wisdom) is a great way to go and highly entertaining. Lions at #3, carried by an excellent (so far) defense, and only mediocre on offense. No Lions fan (or anyone else for that matter) saw that coming before the season. St Louis at #9 offense, Wow! That's surprising although Austin Davis has been decent I thought they would be around #20.
how do PHI and CHI sit in the Good O / Good D quadrant but rank in the bottom half of all teams? 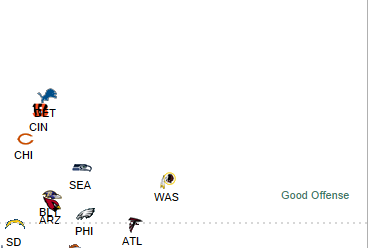 @Anonymous at top: you're right, Washington's special teams were horrific last year. Since no one else does it, I kept track of EPA special teams stats last year, and they were on the bottom, KC at top. When the two played each other last year, it was the "special teams perfect storm". Washington got killed 45-10, the special teams imbalance highlighted by KC's Quinton Demps' 95-yard kickoff return. It would be awesome if these efficiency ratings could take into account special teams. I'm not talking about "fluky" plays (TD returns), but the general advantage of field position that special teams give. It may not be a huge advantage, but it's real. Are the O Rank and D Rank adjusted for opponent? @James - I agree...the only thing I can think of is that it's taking into account strength of schedule. Since St. Louis and Tennessee have had games against other teams where they've given up a ton of points, Dallas' offensive performance against those teams isn't rated very high...that's my guess. Correct me if I'm wrong, but O Rank and D Rank are weighted vs the SoS of the team's they played's respective defensive and offensive GWP, whereas overall GWP is weighted against the team's they've played's overall GWP. That is why you get anomalies like WAS having better offense and defense than the team above. Brian (or anyone that knows the model) - quick question. Lets say you have a hypothetical team that averages 10 yards per attempt passing and 3 yards per attempt rushing. This team would be ranked very high in the model (assuming average / decent defensive numbers). What happens though, if the coach decides that they are going to run 99% of plays from scrimmage. Is % attempts (pass vs. rush) built into model at all? or is the assumption that coaches are smart enough to zero in on (or near) the optimal balance. its rarer to see this kind of thing in NFL, but there's obvious examples of college teams that do this (Army has 8 YPA but runs the ball almost exclusively - how would a model capture that? ).